Alternative Views Publishing, 9780982307922, 250pp. What if nature's revenge needed a little help? Ilon knew in his heart what it meant to be scheduled for extinction, but how could he ever convince the Egris, hunted for their hides, to fight? The Battle for Tomorrow is a tale of deep ecology with a militant edge, of animal instinct colliding with technology in a battle where the stakes are extinction or planetary conquest. This fast-paced novel takes us into the mind of an animal scheduled for extinction by a technologically-advanced culture, merely for the beauty of their hides. 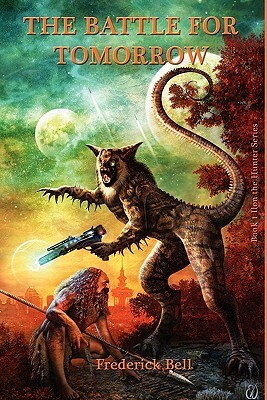 In this fully imagined alternative world, the Egris had evolved on wide plains and lush forests as pack hunters, but were no match for the guns of the Iranha. Their only sin was to stand in the way of colonization as the Iranha fled the self-inflicted ruin of their home planet. With the mysterious appearance in Ilon the Hunter the balance of nature is altered in a startling evolutionary leap. But why? And by whom? Ilon himself only has clues to his dark past, enough to know that he had already lived the future of the Egris, his own species hunted to extinction once on Earth. How can he get them to understand the danger and turn on the invaders in The Battle for Tomorrow?